J.J. Watt didn't need a helmet to bring down Chiefs quarterback Alex Smith. Texans defensive end J.J. Watt didn’t even need a helmet Sunday to pick up where he left off last year in Houston’s season opener against the Kansas City Chiefs. 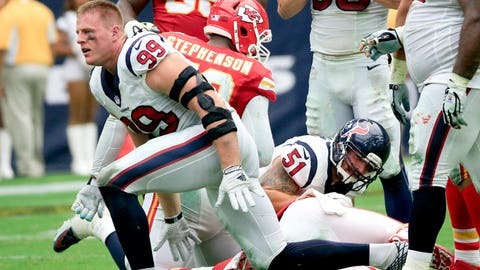 Watt, who recorded 20.5 sacks in 2014 en route to being named NFL Defensive Player of the Year, sacked Chiefs quarterback Alex Smith in the second half of Sunday’s game despite losing his helmet on the play. The Texans season got off to a shaky start with new starting quarterback Brian Hoyer throwing an interception on his first play of year, but Watt, at least, appears to be in midseason form. He had two sacks through three quarters. The Chiefs went on to win, 27-20.